View More In Weather Monitoring Clocks. The General Tools and Instruments DTH04 Temperature and Humidity Monitor with Clock effectively measures, monitors and displays temperature, time and humidity. 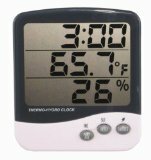 3 row display shows temperature, humidity and all in current time. Choose between Fahrenheit and Celsius temperature units. Clock can display 12 or 24 hour time. Minimum and maximum temperature and humidity memory makes it easy to track dips and spikes. Runs on 1 AAA battery (included); features a jumbo digital display for easy reading. If you have any questions about this product by General Tools, contact us by completing and submitting the form below. If you are looking for a specif part number, please include it with your message.